James Marshall Miller was one of the most vocal American planning professionals stimulating exchange between U.S. urban planning and postwar European reconstruction during the 1950s and 60s. At a time when most of his colleagues ceased their “Atlantic crossings,” he undertook onerous endeavors to advertise the rebuilding of Europe to the American professional public as well as to boost his profile as a cosmopolitan expert. Tracing his career allows us to attach more weight to the argument that even during a period of U.S. cultural and political hegemony, transatlantic relations were more complex than previous narratives of unidirectional “Americanization” suggest. Miller may have developed his affinity for European planning during his work for community architect Clarence Stein. After studying architecture, anthropology, and archaeology at the University of Southern California in Los Angeles from 1925 to 1937 and receiving a master of science degree from Columbia University in 1941, Miller briefly worked in Stein’s New York office. Stein represented an earlier generation of American planners that had developed their ideas on urban and social reform by looking closely at European models. Being in charge of applying Stein’s community planning concepts to the reconstruction of ancient Greek cities Canea and Larissa, Miller engaged in his first—albeit largely unsuccessful—transatlantic endeavor. It was not until the end of World War II that Miller began to developed transatlantic projects of his own, now working as a professor for planning at Columbia University (since 1941). In contrast to the majority of American planners who had lost interest in “learning from abroad” as they became involved in the numerous technical aid missions of the global Cold War, Miller considered it “most desirable that planners of America and planners of other countries seek ways and means of meeting together more often.” Convinced that the reconstruction of Western Europe might provide a useful model for American cities struggling with deteriorating downtowns and unprecedented suburbanization, Miller believed that American planners should continue a dialogue among equals with their European colleagues instead of restricting themselves to attempts to teach American lessons to their peers around the world. In postwar America, he was one of the first to professionally organize study tours to Europe, visiting reconstruction efforts in progress in Holland, community planning projects in Sweden, and new towns in England in 1952 and 1954. During these years, he also engaged in the like-minded U.S. Committee for the International Federation for Housing and Planning (IFHP), which aimed at reviving the American planning scene’s transatlantic links by means of the Federation and its biannual conferences, e.g. in Edinburgh (1954), Vienna (1956), and Liège (1958). Thus, Miller assisted in restoring the U.S. planning field’s European connections. Miller developed a grand plan on how to employ European urbanist knowledge for domestic purposes through study tours, IFHP meetings, a visiting professorship in Copenhagen (1954), and a lecture tour through West Germany (1957). While American planners struggled with blighted downtowns and “white flight” to suburbia, Miller learned how war-damaged communities in the Netherlands and West Germany had escaped both the decline of inner cities and suburban sprawl by building pedestrianized shopping streets and comprehensively planning cities and suburbs. Like Austrian émigré Victor Gruen, who designed America’s first pedestrianized main street in Kalamazoo around the same time, Miller developed an aesthetic preference for these ambitious European redevelopment projects. Convinced that these examples could spice up the U.S. discourse, he devised a plan for an international conference with the intention of introducing American professionals to European reconstruction. The 1958 International Seminar on Urban Renewal became the centerpiece of Miller’s transatlantic networking efforts. 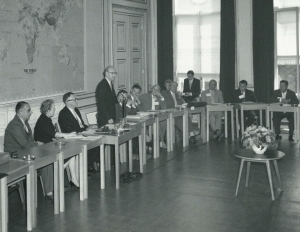 With the help of his USC and IFHP colleagues and equipped with a Ford Foundation grant, Miller brought eleven Americans representing federal institutions, local and regional planning departments, housing authorities, professional journals, and expert organizations to The Hague in August 1958. He introduced these experts to leading European planners, showed them major projects such as the pedestrianized shopping and residential area Lijnbaan in Rotterdam, staged an international exhibition, and organized round table discussions on a variety of topics relating to urban renewal. The conference proceedings reveal that the majority of U.S. visitors showed an avid interest in learning from European examples. Summarizing the conference discussions, Miller recorded that attendants of the meeting had concluded that endorsing traffic calming; a mix of residential quarters, office space, and recreation facilities; as well as a comprehensive planning of city and region were the most promising methods for upgrading blighted U.S. downtowns. In the subsequent years, some of the workshop attendants such as Richard Steiner and Herbert Stevens became involved in urban renewal projects—including Baltimore’s Charles Center and Cincinnati’s downtown—that followed some of the planning ideas discussed in The Hague. Additionally, the printed conference proceedings transmitted information on European reconstruction to the discourse on U.S. inner city planning, being cited in articles on pedestrianization in the professional press (such as the Journal of the American Institute of Planners) and finding its way into university libraries across the nation. Although the trend towards pedestrianization, mixed-use zoning, and comprehensive urban and regional planning was still limited in the late 1950s, Miller’s international seminar did help educate some members of the U.S. scene about alternative approaches to downtown redevelopment and foster an interest in European planning. The 1958 seminar thus marks the beginning of a period in which a more equal relationship between an economically booming Europe and a United States mired in urban problems facilitated the transatlantic transfer of planning ideas. Besides educating Americans on the advantages of European reconstruction, Miller also attempted to employ his transatlantic networks for commercial and professional purposes. First, he utilized the 1958 seminar on urban renewal as a stage for self-promotion. He tried to organize the event in a self-serving manner, refusing to consider European proposals and focusing only on the potential benefits of his homeland. Officially criticizing the planning of Utrecht in the Netherlands and proposing an alternative scheme for the reorganization of its traffic, he additionally attempted to style himself as an international expert. Finally, it has been speculated that he aimed to support his nascent publishing company Books International by publishing the conference proceedings. Miller achieved only mixed success with these strategies. Through being able to sell the volume of the 1958 meeting to nearly every American university, he successfully launched his publishing firm. On the other hand, his pompous behavior exasperated most of his American and European colleagues. Although it was common to employ international networks for domestic purposes, his peers generally agreed that he had carried strategic internationalism to excess. For breaking his contract with the Ford Foundation and issuing the conference reports by himself, he was expelled from the IFHP in 1959. Subsequently, Miller was charged by the American Institute of Planners with unethical conduct and had to leave Columbia University in 1963. Additionally, a new planning consultancy firm in which he was involved went out of business after only three years in 1964 while his publishing company failed to attract notable authors. Still, Miller remained committed to his interest in Europe and to transatlantic endeavors. He launched a project for a European capital named “Lake Europe” to restart his deadlocked career by employing his vast knowledge of European urbanism and his still-existent links to the professional scene on the old continent. Following the foundation of the European Economic Community (EEC) in 1957, he began advertising his plans to build a new capital for Europe. An ardent anti-communist and champion of European unity, Miller envisioned Europe as a political entity resembling a strong nation state to serve as a bulwark against the Soviet bloc. To prevent competition between EEC members, he suggested that no existing capital should become the seat of European administration. Convinced that only a newly-built seat of government could strengthen West European cooperation, he proposed the construction of a new capital for Europe close to the borders of Luxembourg, France, and Germany in his book “Lake Europe” (1963). Although he proposed intergovernmental support for “Lake Europe,” he also suggested that semi-public or private companies could develop his city if governments remain reluctant. Miller conceived this city as a monument to the unity of Western Europe with an artificial lake in its center filled with water from all the major rivers of Europe serving as the setting for administrative buildings of the EEC. Referring to ideas from the 1958 seminar on urban renewal, he imagined the rest of his city as a dynamic cluster of neighborhoods. He proposed that urban landscapes should be organized in a way akin to cell division in biology: New neighborhoods should only be built when present ones had reached a maximum number of inhabitants. As the basic unit of the capital of Europe, Miller introduced the notion of a multifunctional neighborhood that included housing, office space, recreational facilities, and vertical traffic separation. In terms of urban design, he opted for modern architecture echoing famous designs such as Marcel Breuer’s UNESCO headquarters. In order to advertise his ideas for the seat of the European government, he started networking with a variety of figures in Europe and America during the 1960s and 1970s. In 1961, he held a ceremony on the future site of the city where he laid its foundation stone. During the same years, he reached out to his former transatlantic network, including Rotterdam planner Cornelis van Traa and Austrian émigré Victor Gruen, to request letters of recommendation. He even attempted to organize an architectural competition for “Lake Europe,” though unsuccessfully. In the 1970s, he developed contacts within the European pacifist scene, represented by Norwegian Pan-Europeanist Hans J. Røgler. Despite these zealous attempts, private firms, governments, and European institutions remained skeptical. Whereas European institutions favored the more pragmatic idea of settling in the already existing cities of Strasbourg and Brussels, building companies did not desire the responsibility of administrating large urban districts. Miller continued to write letters to governments and companies until the late 1970s. However, he gradually lost support among European planning professionals, remaining a lone voice calling for “Lake Europe.” Without official support, his ideas failed as many other world city plans before. In the meantime, he had discovered new career possibilities in America. Withdrawing to California, he spent the rest of his professional life as a planner for smaller cities such as Rosemead. Overall, Miller’s projects reveal the manifold ways in which Americans could employ European expertise for domestic purposes in the postwar decades. Experts could make transatlantic comparisons in order to evaluate domestic policies and to point to alternative solutions for political, societal, and urban problems. On the other hand, they could use their knowledge of European public and urban policies as a means of portraying themselves as cosmopolitan authorities having command of seemingly universally acclaimed expertise. However, the example of Miller also testifies to the various political, economic, and cultural barriers that obstructed the uncomplicated application of transatlantic principles in different national settings. Miller, James M. Lake Europe: A New Capital for a United Europe. New York: Books International, 1963. Miller, James M., ed. New Life for Cities around the World: International Handbook on Urban Renewal. New York: Books International, 1959. Hein, Carola. The Capital of Europe: Architecture and Urban Planning for the European Union. Westport, CT: Praeger, 2004. Joch, Andreas. "‘Must our Cities remain Ugly?’ America's Urban Crisis and the European City: Transatlantic Perspectives on Urban Development." Planning Perspectives 2014 (forthcoming). Wagner, Phillip. "New Life for American Downtowns? The 1958 International Seminar on Urban Renewal and the Travel of Planning Ideas in the North Atlantic World." Planning Perspectives 2014 (forthcoming). Charles S. Ascher Papers, Columbia University, Rare Book and Manuscript Library, New York, NY. IFHP Archive, The Hague, The Netherlands. Private Papers of James Marshall Miller, Carola Hein Archive.